We love yogurt. It’s the magical ingredient found almost everywhere in the culinary world, from drinks to desserts, dips to salad dressings. Personally, I always make sure that there’s adequate supply of yogurt in my fridge—that’s how much I love it. Feel the same way? Then it’s probably time to develop an even deeper relationship with yogurt. How? By making it yourself. I’ll explain why it’s worth the effort, share wonderful pairing ideas, and give you my favorite recipes using yogurt so you can put that first homemade batch to use! Why should you make homemade yogurt? Making something from scratch inherently means investing some extra effort. Hence the question you might be asking yourself: Yogurt is so easily accessible, why should I even try to make it at home? The best answer we have is this: Because it’s incredibly easy! But, if that’s not enough to convince you, we’ve got two other reasons why you should start making yogurt yourself. Homemade yogurt is healthier. If you take a closer look at the nutrition facts, you’ll see that the yogurt sold in supermarkets is often high in sugar and full of preservatives and additives. Plus, those colorful fruits promised on the packaging are sometimes brought to you by artificial flavors—far from the real thing. Making your own yogurt guarantees you more control over the ingredients you use, including the base of your choice and amount of sugar. It can be easily adjusted to your diet preference by leaving out sugar completely or using a vegan base (i.e. soy milk). Our suggestion is to start by making plain yogurt without sugar so you can decide if you want to use it for sweet or savory purposes. It probably doesn’t come as a surprise that homemade yogurt is more economic than store-bought yogurt. The price gap is not mind-bogglingly huge if you compare the price of store-bought milk and yogurt, but think about this way: without the cost of packaging, transport, and advertising, with the same amount of money you can get the best quality milk for your yogurt—the most bang for your buck, so to speak. This leads to another point, which is that homemade yogurt is more environmentally friendly. If your new year’s resolutions include becoming a more sustainable food consumer, start by giving up those small plastic cups and making your own yogurt. For those with a vegan or lactose-free diet, you can adopt the similar method just replacing the ingredients with soy drink and soy yogurt. Making yogurt at home is simply as showed. Before you get started, here are two tips to ensure fail-safe results for your first batch of homemade yogurt. To sterilize jars—the quick and easy method is to soak the jars and lids in boiling water. When cooking milk, set a wooden cooking spoon over the saucepan to prevent milk from bubbling up out of the pan. Should (or shouldn’t I) use a yogurt maker? One of the most common questions when it comes to homemade yogurt is: Do I need a yogurt maker to do it? Yogurt makers are not very expensive and are pretty easy to find online. Their main purpose is to simplify the incubation process by keeping the yogurt at the right temperature for the right amount of time. 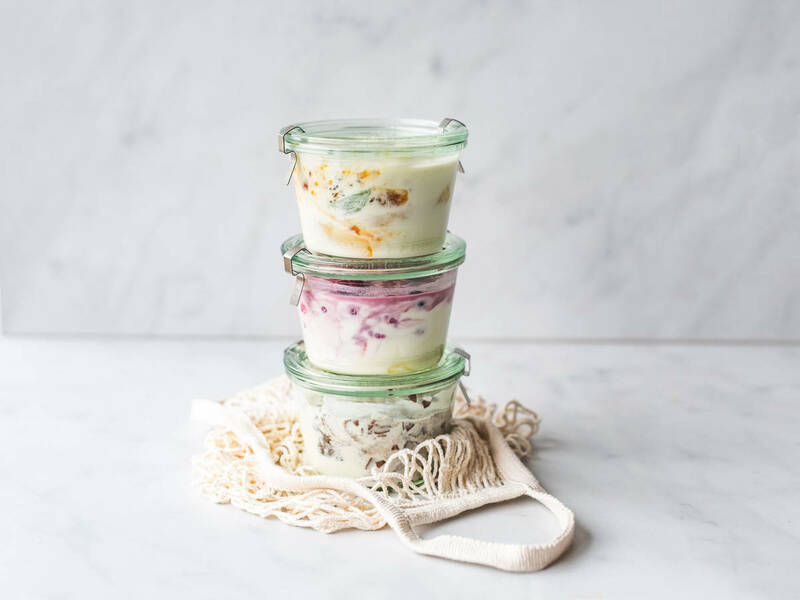 Some yogurt makers are equipped with glass jars to make portioning and carrying them to-go easier. While there are benefits to a yogurt maker, they are by no means necessary for making a proper yogurt, and the chance that it will end up in your basement—practically unused—is, let’s be honest, high. If you have a food thermometer, oven, and a little bit of patience—you’re already halfway there! Once you have mastered homemade plain yogurt, it’s time to get creative and play with the flavors of which there are practically endless options. You can literally add anything you like but some popular choices are fresh and dried fruits, jam, compote, seeds, and nuts. The aesthetic is free as well: You can put them on top, on the bottom (perhaps for the most Instagrammable outcome), or stir them in. And don’t forget yogurt can also be added to your favorite smoothie recipe for a thicker, creamier consistency. Here are some ideas of how to top your yogurt. We’ve come up with a guide where you can choose one or two toppings from each category, or purely pick what you have at home. Seasonal ingredients are always what we love, but of course you can indulge yourself with something sweeter like Oreo cookies if you’d like. If you take yogurt-making one step further, you might be interested in something like homemade Greek yogurt or homemade frozen yogurt. For Greek yogurt, thicker and less moist than normal yogurt, all you need to do is to strain plain yogurt with a few layers of cheesecloth set over a bowl. Set it in the fridge overnight, allowing the liquid to drain out, and voilà: Greek yogurt! For frozen yogurt, it’s even easier: blend plain yogurt, frozen fruits (berries, bananas, mangos), honey, and a tablespoon of lime juice until smooth, then freeze for at least 6 hours. For both kinds of yogurt, you are more than welcome to go through our topping guide again for serving. Take a look at our Raspberry frozen yogurt bites or Quick berry frozen yogurt for more inspiration. Yogurt is way more than just a snack, it could also be the absolute star in desserts, savory dishes, and dressings. Make a larger batch and try out our recipes with your freshly made yogurt! Would you make homemade yogurt? Let us know in the comments or send your unique yogurt recipes to community@kitchenstories.com!